his week, as part of United Nations General Assembly Week in New York, Johnson & Johnson is participating in discussions about the U.N. Millennium Development Goals and the Company’s progress in its five year commitment to goals four, five and six. Those goals focus on reducing child mortality, improving maternal health, and combating HIV-AIDS, malaria and other diseases. Johnson & Johnson has been committed to maternal and child health and disease prevention for more than a century, and the roots of that commitment go back to the 1890s. 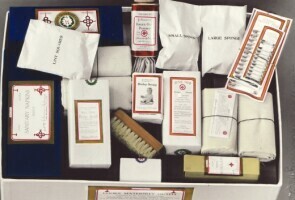 Dr. Simpson’s and Dr. Cooke’s Maternity Kits from Johnson & Johnson, from our archives. In the early 1890s, Johnson & Johnson was less than a decade old. The Company had been making its pioneering mass produced sterile surgical products, it had pioneered the first commercial First Aid Kits, it began selling toothpaste in a tube way back in 1889, and employees were continuing to identify health care needs and find ways to meet them. One of those needs was maternal and child health. During the 1890s, most children were born at home, and expectant parents did not always have a doctor’s help with the birth. Many expectant mothers relied on midwives or, in very rural areas, a neighbor. (These conditions – or worse conditions – remain in place for many women in developing nations today.) In addition, expectant parents generally were the ones responsible for getting any medical supplies that might be needed for childbirth. Without access to medical care — and before the age of the automobile brought the paved roads that enabled easier access to hospitals — there was a higher incidence of maternal and child mortality surrounding childbirth. 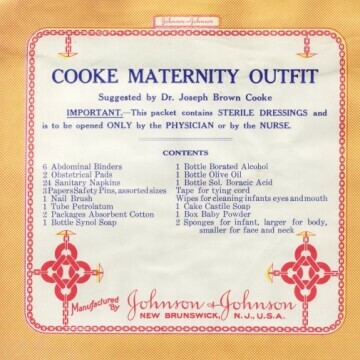 Dr. Cooke’s Maternity Kit label for international version of the kit, circa 1920. From our archives. So to help make childbirth safer, Johnson & Johnson collaborated with two leading obstetricians of the day, Dr. Simpson and Dr. Joseph Brown Cooke (Surgeon to the New York Maternity Hospital and lecturer on obstetrics to the New York City Training School for Nurses), to develop Maternity Kits. 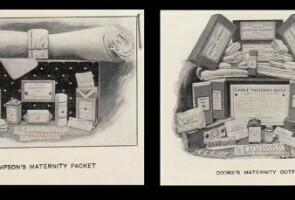 The company put the first kit – Dr. Simpson’s Maternity Kit — on the market beginning in 1894. The Maternity Kits contained everything in one box that the doctor, nurse or midwife would need to ensure a safe delivery for the mother and child, plus instructions on delivering a baby and caring for the mother. Just as the Company highlights the work its partners do today, Johnson & Johnson put the doctors’ names on the kits. The Company made Maternity Kits until the 1920s. A close up look at Dr. Cooke’s Maternity Kit, 1920s. From our archives. Today, Johnson & Johnson works with partners like text4baby to provide free information for expectant mothers on prenatal and newborn care. In the modern world, that’s done via text messaging on mobile phones, since even in areas without much infrastructure, people have access to mobile phones. More than a century ago, Johnson & Johnson provided the same type of free information, using the technology of that era – small booklets that women could carry with them in a pocket. 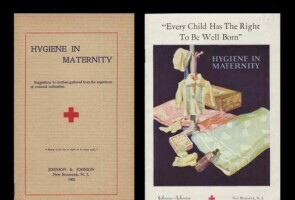 Johnson & Johnson Hygiene in Maternity Booklet, 1902 (left) and 1927 (right). From our archives. These booklets provided free, science-based information for expectant and new parents. Johnson & Johnson also had a campaign called Every Child Has the Right to be Well Born in the early 20th century that sought to improve newborn and infant health. 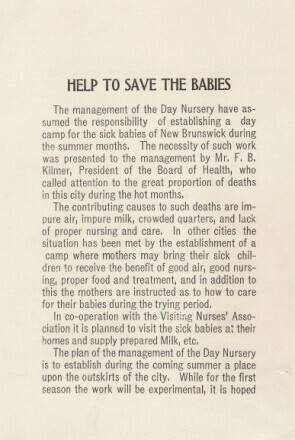 “Save the Babies” information from early New Brunswick, New Jersey infant health campaign. from our archives. Johnson & Johnson Scientific Director and public health pioneer Fred Kilmer also helped lead campaigns to reduce infant mortality, beginning in the Company’s hometown of New Brunswick. This included a day nursery staffed with trained nurses to help sick children, as well as numerous campaigns to reduce the spread of contagious disease. 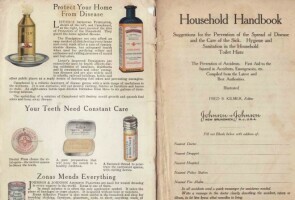 Inside cover of the Johnson & Johnson Household Handbook, showing some of the Company’s early public health products. From our archives. 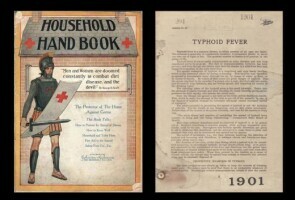 On a broader scale, Johnson & Johnson made a wide range of public health products – disinfectants, antiseptic soaps and more – to help protect people against contagious diseases such as typhoid, diphtheria, and smallpox. The Company also published information for the public to help people protect themselves and their families. More than a century later, maternal and child health and disease prevention remain two major focuses for Johnson & Johnson. In 2010, the Company became one of the first private sector companies to pledge its commitment to the MDG health goals. Today, working with its partners, Johnson & Johnson has reached more than 200 million women and children across the world. You can learn more about this work here, but there’s more: you can also participate! Through the Company’s Donate a Photo app, you can donate a photo from your smartphone to help one of the organizations that’s helping meet these goals, such as Save the Children or DoSomething.org. So now interested blog readers will have the opportunity not just to read about the history of our commitment in these areas, they can also be a part of it.